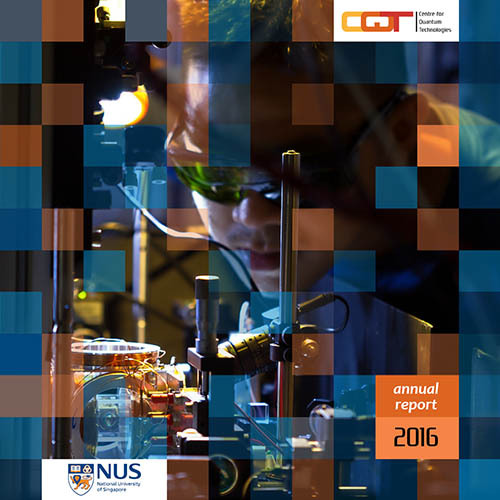 The Centre for Quantum Technologies is pleased to present its annual report for 2016. The report gives an accessible overview of the research and activities at the Centre in the past year. The 2016 report includes an interview with the new Chair of the Centre's Governing Board, Mr Quek Gim Pew, the Chief Defence Scientist of the Singapore Ministry of Defence. He was appointed to CQT's board in November 2016. He says "In a short span of years, I think CQT has made phenomenal progress. I think CQT stands out really as a jewel in Singapore’s R&D landscape". He is following developments in quantum technologies: "I'm hopeful that in 10 to 20 years we will see the next wave of quantum-based products embedded in everyday life, and I think Singapore is well positioned to play a role in this – and this is because we have CQT," he says. Reports for previous years are also available via the website's About Us pages.